Cyrsti's Condo: Just Another Day in Paradise? As you regulars around here in Cyrsti's Condo may know, I have the attention of a seven year old. Plus, I write tons and read very little. 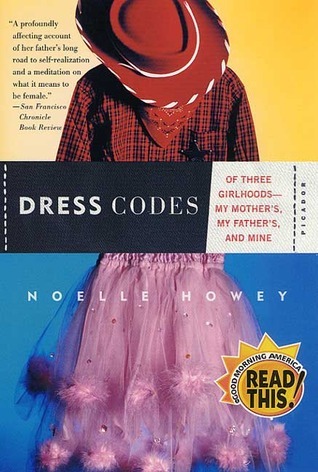 Recently though, Liz acquired a copy of a book called "Dress Codes-Of Three Girlhoods, My Mother's, My Father's and Mine." The book was published back in 2002 by Noelle Howey. Literally, after approximately three months of reading the last 75 pages of a 325 page book, I formed several thoughts: On a pure mechanical basis, I know how hard it was to write my first book "Stilettos on Thin Ice" which wasn't even close to being as long. I wonder how anyone else does it. Secondly, the family perspectives from a generic female on her way to becoming a woman was perhaps too much detail for someone like me-but-that's just me. Also, became quickly apparent too, was how much the overall climate for transgender women and men has changed since she wrote the book. Finally, as I blissfully waded through my reading of "Dress Codes" I was moderately interested in the fact the whole family is from Ohio. Cleveland area to be exact. She began to mention "Christine's" tentative first steps out of the closet came at cross dresser meetings around Cleveland. Christine also mentioned meeting the never charming, self proclaimed transgender pioneer Virginia Prince. I operate in a tunnel and never really wondered about the timing of Christine's cross dresser meetings, until finally Noelle wrote about her (Christine) winning the Miss Paradise Pageant in 1989. And, with the help of electrolysis and HRT, Christine came fully out of the closet. Being the brilliant person I am, my noggin finally kicked in and I remembered I attended a few of those " Paradise Club" meetings in Cleveland in the 1980's. I don't remember a Christine. What I do remember is how diverse some of the meetings were. Not only was I meeting other professed hetero cross dressers, I was meeting another spectrum of attendees ranging from fetish cross dressers to those who (like Christine) had their sights on SRS later in life. The biggest drawback was "Paradise" only lasted a very short time and I hope so many years later, Christine has found hers!